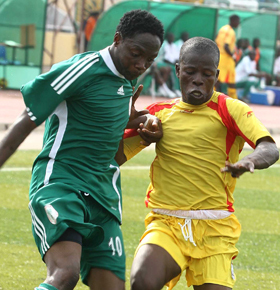 Ahmed Musa, ensured his name entered a special place the history books of Nigerian football when he erased the twenty-year goal record of former league star, Ishaya Jatau, which was equaled last season by Akarandut Orok,naijapremierleague.com reports. The 17-goal record equaled this term by the duo of Musa and Niger Tornadoes’ Eugene Salami, was finally broken when Musa struck in the 10th minute during the rescheduled match between his team, Kano Pillars and Lobi Stars in Makurdi. ‘I’m so happy that I finally achieved my aim of setting a record of 18 goals. Now the team must do its beat to beat Enyimba in the last match of the season to win the Premier League title,’ Musa said in a press statement. With the league ending on Wednesday, Musa and Salami will be presented with another opportunity to increase their goals haul. Interestingly, the match against leaders, Enyimba, will determine the outcome of the league as Pillars are just one point behind the Aba Elephants. Enyimba have 67 points, while Pillars have 66 points. The Elephants need a draw to win their 6th title in 10 years, while Pillars need an outright win to secure their second Nigerian title.